Dust kicks up in coughed swirls below our shuffling feet. Wrapped in a cloud-blotched blue sky, we amble through foot-worn paths, led by our quiet hosts—a dark Ecuadorean man and his 11 year-old son, Jefferson. His mother, six months along, follows behind. We walk maybe a mile, meandering through grassy rolling hills, newly planted fields, an indifferent pig or two sniffing out its next meal. Small cinder-block homes dot the grassy hillocks, and purple mountains frame the landscape. We pass a woman washing clothes by hand, and a nod and the slap of wet fabric on concrete returns our greeting. We make small talk along the way, asking them an occasional tangential question about the fruit on a tree, or trends in the weather, or the distance to our destination. We are in the countryside outside of Otavalo, Ecuador, a largely rural community in the Andes mountains, a few hours north of the capital city of Quito. My son, Justin, and I have been invited as part of a group of pastors and spouses by Compassion International, a non-profit organization which exists as an advocate for children around the world. Their mission is to provide holistic child development—spiritual, economic, social, and physical—for those in poverty to enable them to become responsible and fulfilled Christian adults. We began this adventure with a visit to their home, a small concrete dwelling lacking running water, heating, or even interior doors and exterior windows. I notice the dirt floor, the aging roof, newspapers tacked to the walls to provide warmth at night, the single light bulb which illuminates the sparsely furnished room. Jefferson points to a small photo of a soccer player in midstride. He tells us through our interpreter that it is a photo of his Dad during a national tournament. In his wildest dreams, he wants to be a professional soccer player or a carpenter when he grows up. Jefferson and his parents have invited us to pick strawberries on this beautiful morning. 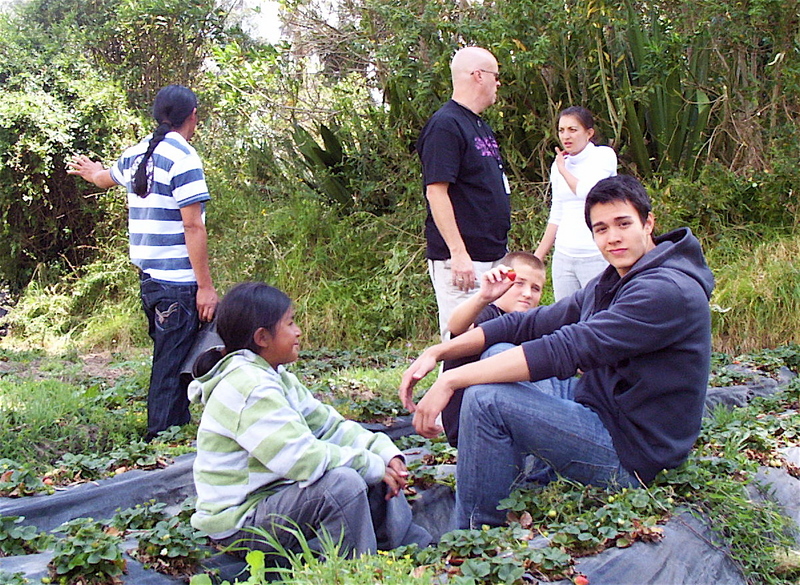 His father, Antonio, leases a small field where he grows strawberries year-round. The field is surrounded by eucalyptus trees, which provide a wind break. He tells us that they can get somewhere between $5 and $12 per bushel, depending on size. 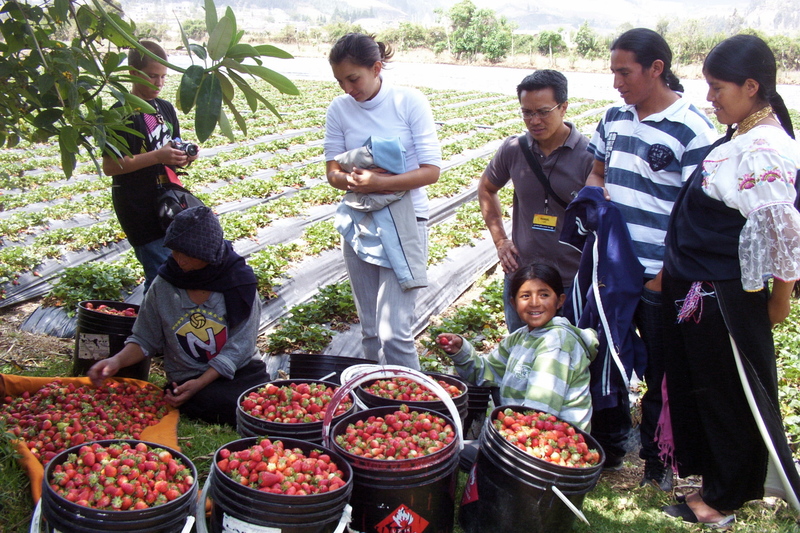 The retailers can then resell the strawberries for $4 per handful. We finally arrive at Antonio’s modest acreage, and a distant familiarity falls upon me. The faint smell of eucalyptus and the row upon row of strawberries begins to remind me of my childhood growing up in the Salinas Valley. As a young boy, I remember being shooed by my parents to my aunt’s backyard where she had a strawberry patch, where we would pick and devour strawberries until we were almost sick. The smell of the strawberries mixed with the dirt on my fingers, and the plop of a handful of strawberries into the bucket, bring waves of emotion to me, as I relive these old memories. I can almost see my two older brothers, who spent summers earning extra money picking strawberries, out in the field with me. And then it suddenly hits me. Though we may be separated by culture and nationality and economy, though we live on different sides of the equator, Jefferson and his parents are more like me than I realize. We both came from agricultural backgrounds, both work hard and strive to better our lives, both have hopes and dreams for ourselves and for our children. And we both have Christ as our Lord. We share a primary citizenship in heaven, which makes me closer to Jefferson and his parents than to my neighbor in the suburbs. I am at once humbled and honored to be with them here, between the sun that God set in the sky and the soil that is their home. Our day with Jefferson and his family was just one of many adventures on our Compassion Trip to Ecuador. We also visited Child Development Centers in Otavalo and Quito and saw firsthand how hundreds of children’s lives are being transformed. 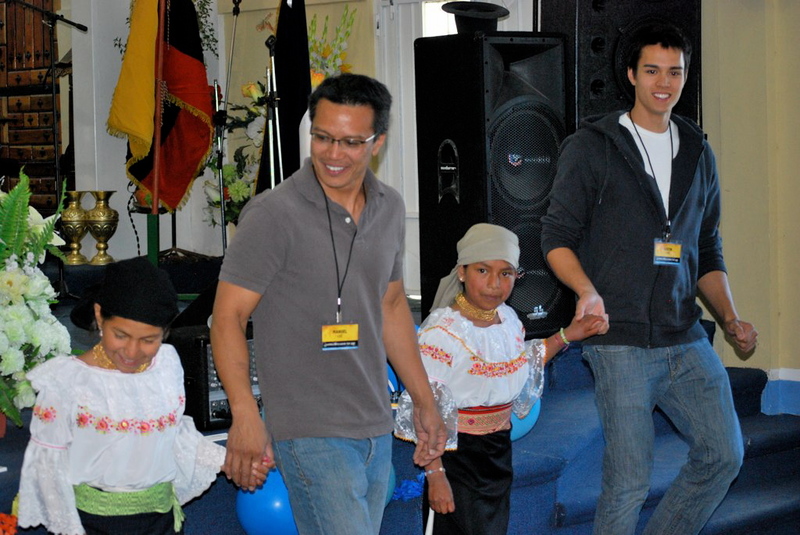 We visited the Compassion Ecuador Headquarters to see how they are effectively and efficiently doing the work. We visited with another family in southern Quito, with pregnant and new moms with their babies enrolled with the Child Survival Program, and with young adults participating in a Compassion-sponsored Leadership Development Program. Everywhere we went, we were being introduced to young adults–teachers and financiers and other professionals–who were former Compassion-sponsored children. It was amazing to see how Compassion was working towards transforming not just individual lives, but families and even communities with a quiet but undeniable influence. One other aspect continues to put a smile on my face, and that is that I was given the opportunity to bring Justin on the trip with me. To see him interact with the children and with the larger world outside of his own–I was so very proud of him throughout the entire trip. If you are interested in knowing more about Compassion International, I encourage you to do so. I cannot tell you how impressed I was by the professionalism, care, effectiveness, and grace-filled love demonstrated by their people. NOTE: I strongly urge you to check out Compassion International and consider supporting their world-changing efforts through the sponsorship of children around the world—in the name of Jesus Christ. Check them out at Compassion. 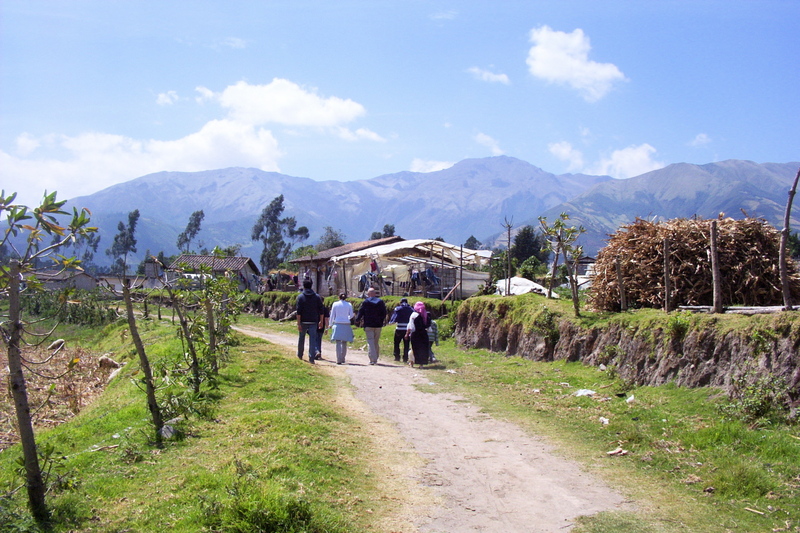 Posted in art, Blog, christianity, faith, missionsTagged Children, christianity, Compassion, Ecuador, Missions Trip, QuitoBookmark the permalink. Reading this made me feel like I was back in Ecuador. Thanks for sharing your blog and your heart. Tell Justin hello too.